Louvre panel systems are popular with designers for many applications in industrial and commercial buildings. 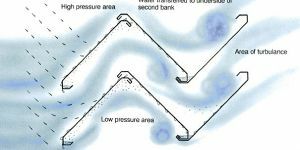 Their purpose can be to control light entry, to provide ventilation whilst maintaining rain defence, to provide screening, or a combination of these. Louvres can also be provided simply for aesthetic impact. 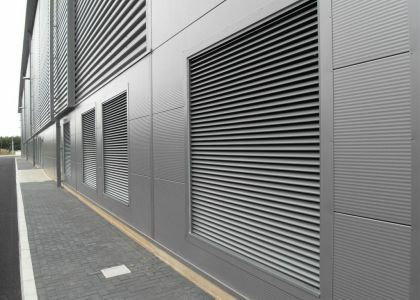 Colt Universal Louvres - roll-formed single, double or triple bank system. E Series Louvres - extruded single bank system. Colt louvre systems are highly adaptable. They are available in various configurations, materials, finishes and coatings to meet the requirements of almost any project. Besides louvre panels being available in aluminium, there are all manner of glass, textile, wood, terracotta clay and translucent acrylic louvres available depending upon the aesthetic and energetic requirements. Colt louvres can be uniquely configured to provide the solution to your needs. For generic features and benefits of Colt louvre systems, click here. With Colt louvre systems, the possibilities are endless. For all products, a large selection of optional accessories is available, such as mitred corners, special shapes or louvre doors. If noise reduction is required, acoustic louvre panels may be used. What are the considerations when designing a louvre system?